Dog Days is one of those movies that will definitely tug at your heart strings. It stars a boatload of adorable dogs and oh yeah, some humans too. Directed by Ken Marino, Dog Days follows a group of interconnected people in Los Angeles who are brought together by their lovable canine companions. Our own Bonnie Laufer caught up with director Ken Marino and some of the film’s ensemble cast including Nina Dobrev (Degrassi: The Next Generation), Vanessa Hudgens (High School Musical), Adam Pally (The Mindy Project), Eva Longoria (Desperate Housewives) and comedian Tone Bell (Disjointed) to find out more about their canine co-stars. 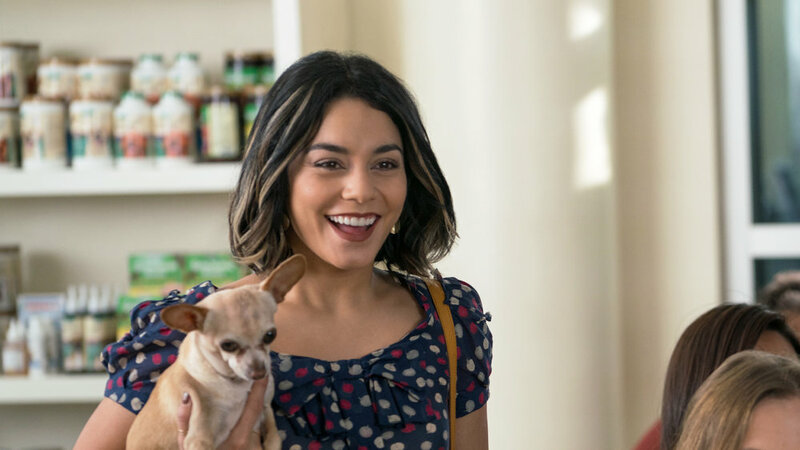 Dog Days' dog lover Vanessa Hudgens: Yes, you heard me right - cats equal Satan. Ken Marino: “When I made How to be a Latin Lover last year, we really wanted to make sure it was something that families could go see. After I did that, I wanted to do another one because I was able to bring my whole family on board to help with the process. OC: Eva, did you grow up having a pet dog? OC: Eva, making this film must have really hit home for you especially now that you are a new mom. EL: “It was Interesting, because I was newly pregnant when we started the film, and I was so tired. Ken was literally one of the only people in the world who knew that I was pregnant, because I didn't want him to think that I was lazy. But I got through it. Nina Dobrev plays a morning news host and dog-lover in Dog Days. OC: I would think that when you get the casting call for a movie like this if you’re not a dog lover then you need not apply. OC: What is it about dogs that brings people together? OC: Adam, when you were growing up did you have a pet dog? OC: Why is it so different having a cat as a pet opposed to a dog? OC: What do think it is about dogs that brings people together? AP: “It’s like anything in life when you find a like-minded interest. You’re willing to learn more about that person because you share that one thing. OC: It’s been said never work with kids and animals, so were there any puppy mishaps on the set? OC: Oh come on, really? OC: So, I guess what you’re saying is that it’s much better to work with animals that it is with humans? OC: Yeah, but they could mess up something else.